Reach your full yield potential with the In-Cab Remote support system and the rest of the Raven Applied Technologies precision package. This precision package is found in every 2019 model year Apache Sprayer (with Raven Viper 4+ controls). From boom controls to application controls, guidance and steering to field computers — this easy all-in-one support system has helped define the next generation of excellence and efficiency in precision spraying. 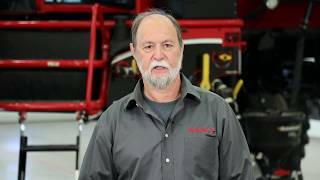 When you need support, you can depend on the Raven precision package to connect you quickly and securely to the experts. The factory-installed Raven Viper® 4+ field computer works in tangent with the RS1™ antenna to activate the In-Cab Remote support feature which allows Apache Sprayer specialists to securely connect to your sprayer within minutes. All three tools combined, give 2019 model year Apache Sprayer owners the power to be more accurate, solve problems faster and cover more acres in a day. 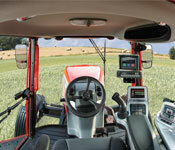 The innovative In-Cab Remote system is activated by an Apache Sprayers dealer at the time of delivery and set up. Owners receive on-the-spot support in the field by calling their dealer and sharing their custom passcode to allow remote access to their sprayer’s computer systems. From there, dealers can see the issue at hand and help troubleshoot or solve the problem. The In-Cab system connects via the RS1 data plan or a highspeed cell phone Hot Spot connection. This remote technology was developed to work as an open ecosystem, meaning it’s designed to work with software developed by other companies to expand opportunities and improve productivity. Using a secure online account (that can be updated in near real-time), Apache Sprayer operators can track, collect and analyze data from any asset it’s connected to at the place and time they so choose. Look back at maps and records from prior seasons to compare one year to the next or plan, budget and schedule items in ways that were simply impossible with thumb drives and other methods to move data to and from the field. No more lost data or downtime from changes to work orders or prescription maps. The system also lets you remotely control profiles and settings across an entire fleet of hardware. Equipment Technologies offers a free two-year Silver package data plan (see details below) with every Raven factory-installed computer system. That means when new software updates are released they are immediately available to download to your machine at no extra cost. Want more options with your Raven precision package? Apache Sprayer owners can upgrade to the Bronze, Silver or Gold data package. * These packages will upgrade the user’s account to allow additional file transfers, prescription map uploads, machine to machine file transfer and a job generator tool.